From delaying the effective date for the $15 minimum wage until 2024 to encouraging the rapid spread of gentrification in his ward, Frey has done everything in his power to satisfy developers and business owners while willfully neglecting the poor and working-class people of Minneapolis. His perspective on policing sheds even more light on his disinterest in the safety of Black people, Indigenous people, poor people, queer people, immigrants, homeless youth and other victims of police violence. Frey acknowledges that Minneapolis has the worst community-police relations in our city’s history. His proposed solution is an increase in police officers, lamenting that “we don’t have the budget to go up by 50–100 per year.” What Frey seems to miss is that community-police relations are at their worst because Minneapolis’ police force was never meant to protect and serve its residents, but rather, to protect white wealth, repress dissent and harass Black, Indigenous and other marginalized communities of color. Extensive research from criminologists shows that an increase in the size of a police force has no correlation with a reduction in crime. Increasing police presence won’t stop crime—it will further endanger the communities that are disproportionately targeted by police officers. Frey reasons that the Minneapolis Police Department needs to add more police because we are behind the national average of police per capita. We need look no further than Chicago, which has twice the ratio of police officers to civilians, to see that a high number of police per capita doesn’t correlate with a low crime rate. Across the U.S., conservative and liberal politicians alike continue to call for more cops while willfully ignoring the root causes of crime. Any city that doesn’t provide all of its residents with the resources they need to live healthy lives will continue to deal with the realities of violent crime. The 2018 city budget for Minneapolis allots the police department $179 million of taxpayer money, over one-third of the city’s general fund. Meanwhile, less than $16 million will be spent on the development of affordable housing and less than $5 million on youth development. It’s disheartening to see police terror prioritized over affordable housing, youth development, education, livable wages, employment opportunities and mental health resources. If the city council seeks to alleviate our glaring racial disparities, the fundamental material needs of Minneapolis residents must be paramount. Although reforms such as body cameras, diversity hiring, implicit bias training and citizen review boards sound promising, our city’s history has shown that reforms are incapable of changing the racist nature of the Minneapolis Police Department. In May 2015, patrol officers went through human bias training, yet later that year we lost Jamar Clark at the hands of Minneapolis police. Increased policing means an increase in danger and violence for Black and brown people frequently targeted by police for intervention because of their race. The ACLU found that in Minneapolis, Black people are 8.7 times more likely than white people to be arrested for a low-level offense. For working-class people, being arrested oftentimes results in job loss which can have devastating consequences for people who struggle to afford food and rent. The police do not prevent crime—they disproportionately deliver Black bodies to jail to await a racist justice system. The City of Minneapolis and Mayor Frey must get clear on their priorities and demonstrate clearly to the public which side they are on. In recent years, Minneapolis residents and community organizers have been vocal in demanding divestment from our dysfunctional police department and investment in community. In 2017, a coalition of young leaders from Black Liberation Project, Young People’s Action Coalition, and Youth Out Loud collaborated on the #no2SROs campaign in an effort to prevent the Minneapolis Public School Board from renewing a contract with the Minneapolis Police Department for School Resource Officers. Despite voicing their concerns at Minneapolis School Board meetings, organizing student protests, and proposing data-backed restorative justice practices as an alternative to SROs, the school board voted 8-1 to approve the contract. 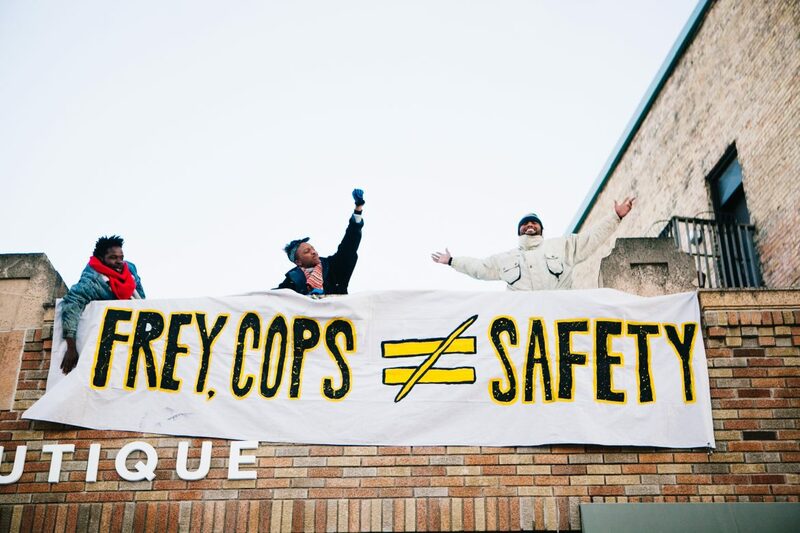 In February, Black Visions Collective organized a shutdown of the block outside of Jacob Frey’s condo, demanding an immediate freeze in police hiring and a sizeable investment in affordable housing. Organizers sought to highlight our representatives’ willful neglect of the racial disparities in Minneapolis and complacency in the state violence Black folks face on a daily basis. Jacob Frey will likely propose slight changes in the city budget for the sake of political expediency, but marginalized folks in Minneapolis are demanding substantive changes. It’s imperative that we continue making interventions to invoke a grander vision about the world we can co-create together, a world beyond the greed and limited freedom that capitalism offers. We ask everyone to join us as we call on our city to divest from violence, invest in community and imagine what’s possible. Where politicians fall short on their promises to represent their constituents, our resilient communities will be there to demand justice. #MoreCopsforWho? Abijah Archer is an organizer, artist and writer, born in Spanish Town, Jamaica. He moved to Minneapolis at a young age, where he discovered the power of collective action and developed a passion for creating music. He is currently organizing with Black Visions Collective and attending Stanford University where he’s pursuing a degree in African and African American Studies. Marginalized folks and their supporters need to start a tightly organized effort to gather people for meetings and strategize how to get him out of office for the next Mayoral election. You know who he is and where he is coming from. No need to wait for last minute election year plans. Plan now to remove him from the mayors office. Make him a 1 Term Mayor. Show him the People’s Power. Frey lives in a fairly small one-bedroom apartment that he and his wife rent. But condo, sure. The police problem didn’t happen overnight, and it won’t be fixed overnight. These organizers aren’t living in reality. Suffice to say, we come to work every day looking for innovative ways to make sure only the most deserving people in Hennepin County wind up in the criminal justice system.